Beauty meets brains - the traditional has been transformed into the innovative with the battery-powered Fossil Q Virginia ladies' hybrid smartwatch. Get notified of texts and calls, customise buttons and change time zones with ease. 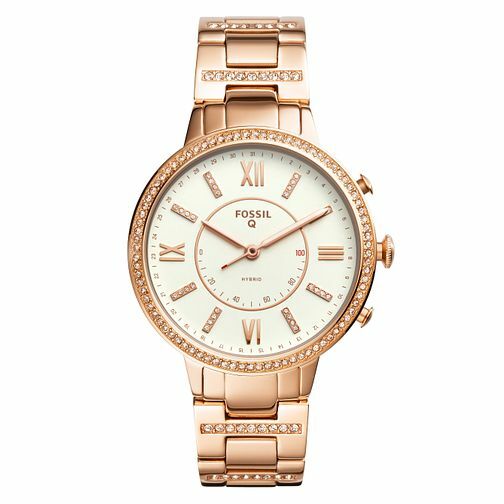 With a rose gold tone stainless steel bracelet and case set with glistening stones and a feminine dial with stone-set hour markers and rose gold tone elements, this ladies' hybrid smartwatch is a perfect piece of glamour to accessorise any outfit. Powered by the Fossil Q App, Fossil Q Hybrid Smartwatches are compatible with Android OS 5.0+ and iOS 9.0+ devices.